Everything was new at the Toronto Jazz Festival this year. Lots of new faces in the staff and, of course, a brand new venue - Yorkville - with lots of outdoor stages for free shows and ticketed concerts at Koerner Hall, the Concert Hall and others. The residents seem to be digging it - it sure is an upscale crowd. Saw Mavis at Koerner and it was quite uplifting. Both the Mavis and Hudson shows were completely sold out which meant I watched most of the show on the big screen in the green room (and I have to admit the sound was pretty good) but I did poke into the hall long enough to graph a little Instagram clip. I think I preferred Scofield when he came with his "Uberjam" with Avi Bortnick on second guitar and electronics. He was doing some cool things with Ableton Live. This time, Sco did not have a pedal on the floor. He might have had one behind him on that VOX amp. I noticed that Vox amps were a little more prominent than Fenders in the backline this year. Rick Holmstrom from Mavis' band tod me he had requested a Vox AC-30 and had bought one for home. We talked about the great Tremolo they have. I read somewhere that VOX tremolo uses a very different approach than Fender - and you can hear it. 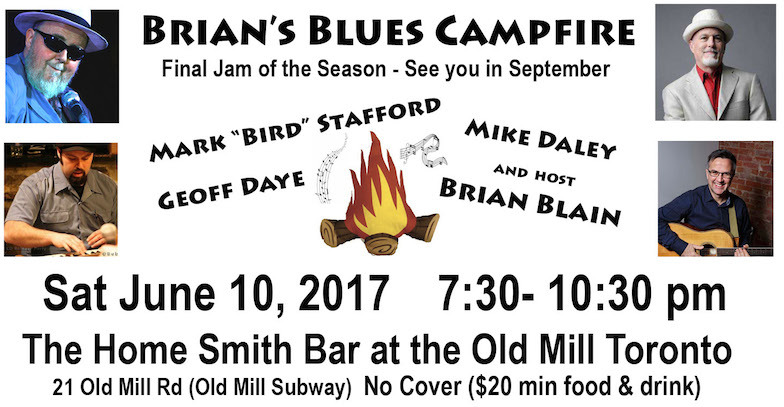 June 10 will be the final "Second Saturday" Campfire Jam at the Old Mill but it looks like we'll be back in September. Mark "Bird" Stafford has been a mainstay on the Toronto blues scene since I got to town in the early 90s. A great harp player of the "fat tone" school and now doing double duty on drums and percussion. 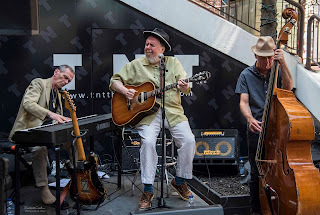 He's bringing along one of his favourite piano players, Geoff Daye and I took this opportunity to invite a guitarist who has made a big impression on me every time I heard him (blues and otherwise) and his name is Mike Daley. He's also a respected academic, teaching ethno-musicology at York University. He's teaching a credit course on Bob Dylan - now that's something that would have kept me in college. As usual, we'll be swapping songs and stories and I'm sure a good time will be had by all. I'm happy to report that the Southside Shuffle has given me a date and the Toronto Jazz Festival invited me to play this year. I'll be seizing the moment to gather up some friends and have a little celebration of my 25 years on staff at the jazz festival as (barely)managing editor and intermittent IT guy. They even consulted with me occasionally on Blues acts...until I got them to bring in one of my favourite artists, Mighty Sam McClain and then had to watch as he played to a half-empty tent. Oh well, there's a reason I'm not a promoter. And the first lesson you learn as a promoter is don't book someone just because you like them. I didn't get to play the Orangeville bluesfest for the first time but I saw a lot on Facebook Live and looks like they had a great festival. I remember last year - I must have had 4 plays and if it hadn't been for Joel coming with me to drive and shlepp the gear, it would have near killed me. I remember I was pretty wiped when I got back home. I guess I'm just feeling my age...Last week for the first time in my career I went to a venue, took down the posters and told the bartender I wouldn't be back. It wasn't because last time we were greeted by the club owner complaining that our jam would interfere with the Raptors game on TV, or even that they shortchanged me on my fee. It was just way too exhausting to bring in a PA, two amps and three guitars and play all night long (we don't take many breaks at the Campfire Jam). I was totally wiped out the next day. I still think there's room for me in the Blues landscape. How often do you get to hear the slow-cooked grooves of a guitar player who's been perfecting the same riffs (on the same guitar) for fifty years without ever having the benefit of a guitar lesson or the burden of a rehearsal. I was told very early in life that I was adopted and never gave it much thought. I remember at some point when I was still very young I said to my mother that I would like to search for my "real" mother and I saw from the expression on her face that I had crossed some kind of line and I never brought it up again - and put that thought out of my head. A couple of years before she died she pulled me to her beside and told me the story of how the adoption happened and that she thought my name had been Robert. I wrote that story into my song, Enfant Choisi, but still never gave it a lot of thought. I was thrilled to be invited to do an opening set for Terry Gillespie's CD launch - and doubly excited to play the legendary Dakota Tavern for the first time. I don't know if you can call a venue "legendary" when they haven't been around forever but the Dakota has made quite a rep for itself in the roots music scene and I can see why people like to play there. The sound was great and the sound person was downright helpful and friendly - even brought me a guitar stand. Richard Flohil, who called me to do the gig, had suggested I bring a bass player but I rarely do that for this sort of gig so I was going to do it alone but just a couple of days before the gig I saw Terry Wilkins' name pop up on my Facebook and I thought "I haven't played with him in a long time". I was sure he'd be booked on a Saturday night, and in fact he had two gigs on that Saturday, but the last one finished about the same time we had to start and it was right across the street so he came right over and played with me and it was a delight. He actually did some homework (a concept which is alien to me) and had every tune nailed right from the start. A consummate pro. I had a great visit with Sherman Lee Dillon last month as he came through our town for a bunch of dates. He's a genuine Mississippi bluesman though he's white and Catholic. He came up in Jackson Mississippi and his son now operates an after-hours juke joint on Farish Street in a building which once housed the offices and studio of Trumpet Records where "Dust My Broom" and many blues classics were recorded. I spent a little time at his place in Jackson and was glad to return the favour and put him up in Toronto and show him around a bit. As I was heading down to the Blue Goose to see him play I got a call from "The Prof", Scott Cushnie and I offered to pick him up and take him along. He had a great reunion with Michael Fonfara and some other players and it would have been great to get Sherman and Prof together to share stories (they've both got a whack of them) but it was not to be. 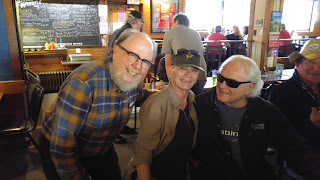 Just driving to the Goose I was hearing these amazing stories of his early days with Ronnie Hawkins pre-Band. In fact, it was Prof who brought Robbie Robertson to the Hawk because they were playing together in a band called The Suedes. Scott hasn't been playing much lately but I'm intent on getting him out for a gig one of these days. 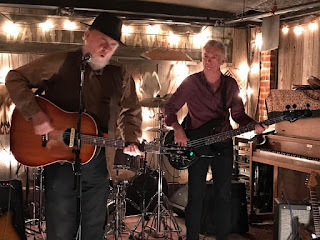 I tagged along with Sherman Lee to the Moonshine Cafe where he was doing a double bill with New Brunswick bluesman Keith Hallett. Keith is a local hero in Fredericton and I remember hearing just a couple of tunes from him when I was down there playing the Harvest Jazz & Blues Festival. What I heard at the Moonshine was not what I remembered from Fredericton but he has cultivated a sound all his own - accentuated by a vocal mic that he plugs into a guitar amp. For a guy playing without any accompaniment he did not hesitate to take long guitar solos - as opposed to Sherman Lee who kept his tunes slim and trim. Here's an Instagram clip I posted. I'll be heading over to Hugh's Room Live on June 8th for Kim Doolittle's CD launch. She's put together a great band headed by Ken Whiteley and the show will have most of the guys who played on the album. It's called "Into The Blue" and the tracks I've heard have been very sweet. Lots more great blues coming up in the next few weeks. 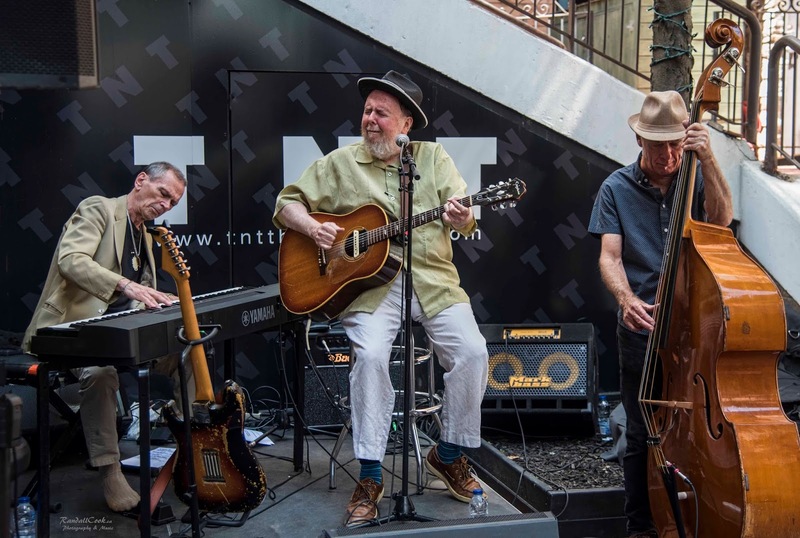 Sean Pinchin will be playing the Toronto Blues Society Birthday Party on Friday June 16 (6pm) at the Island Cafe on Ward's Island. You may have heard that the island is swamped but the ferrys are running and you just have to say when you get your ticket that you've got a reservation at the Island Cafe. The same night, Gary Kendall has organized a big bash to celebrate that venerable blues shrine of the 90s, The Silver Dollar Room. The gang from his band, Downchild, will all be there and many more. Where did I come from anyway? 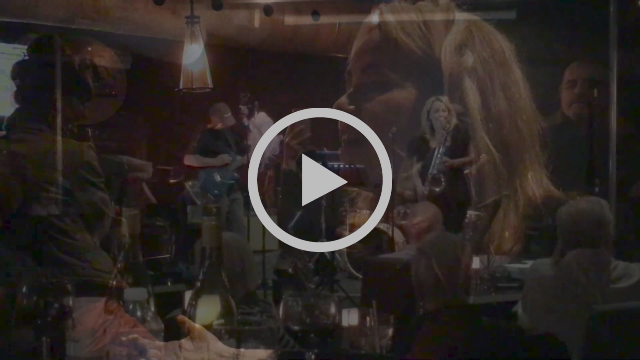 I've been enjoying some Facebook Live moments from the Orangeville Blues & Jazz festival - that's a festival I've played for the last few years but not this time - and it would be wrong to start thinking one was "entitled" to play a festival just because you've played it the last few years. I remember last year - I must have had 4 plays and if it hadn't been for Joel coming with me to drive and shlepp the gear, it would have near killed me. I remember I was pretty wiped when I got back home. I still think there's room for me in the Blues Diaspora. How often do you get to hear slow-cooked grooves of a guitar player who's been perfecting the same riffs (on the same guitar) for fifty years without ever having the benefit of a lesson or the burden of a rehearsal. Brian Blain jokes that he had his "15 minutes of fame" back in the 70s and it wouldn't be fair to take up too much limelight with so many hopefuls trying to get their music heard. Instead he's been more focused on encouraging and introducing new and not-so-new talent through his behind-the-scenes efforts as an editor, publisher, blogger and hosting his popular Blues Campfires.